Innocents (also known as civilians, citizens, or victims) are non-enemies, usually normal people, scattered among the levels. They cannot/do not harm Caleb or the Chosen, and either run screaming in a panic, or cower when they approach. They also do not do any harm to Cabal or Beta Reality creatures. They also have low hit points and can be killed easily with no consequences. 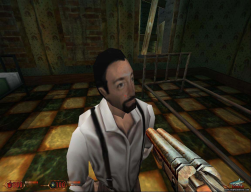 Many games of this era had some type of killable entity that was not relevant to the central game play - Duke Nukem 3D had strippers, Shadow Warrior had anime girls (however, some of them can attack if player will start bothering them), Hexen II had sheep. These are innocent bystanders who appear as shirtless, rag-wearing men with blank faces. They are often seen in civilized areas such as E3M1: Ghost Town or E1M4: Dark Carnival. They are not a direct threat, but might get in the way of some bullets meant for Cabal. On death, they have a chance of dropping a Life Essence, meaning they are useful as resources. They are sometimes locked up as prisoners in cages, such as in E4M1: Butchery Loves Company. If approached or attacked, they will run screaming in a panic, yelling "Go Away!" or "There's no place like home!". In the most part of their debuts, they are surrounded by the Cabal and likely will die unless a heroic player help them, but rarely, they may also appear out of imminent danger other than Caleb himself. 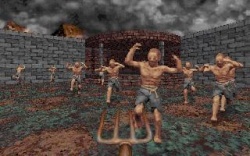 Notably, the only times the player must kill a civilian in order to proceed are E2M2: The Lumber Mill (the civilian hanged onto a machine), E3M4: The Sick Ward (if the player don't go throgh the secret level, he must trigger a trap which will kill some caged civilians) and E4M2: Breeding Grounds (the first civilian, holding the Skull key). 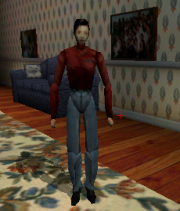 Mimes appear in the E1M4: Dark Carnival and E1M8: House of Horrors. They look like common French mimes, moving their arms as if performing the "Invisible Box" routine. They remain stationary and have even less health points than citizens, but they can be used as stepping stones to reach secret areas. Unlike the ordinary civilians, they are completely ignored by the Cabal henchmen, and probably will die by the player's actions. Caleb is disgusted by mimes and upon killing one he utters phrases like "I HATE mimes!" and "Boo-hoo, when's the hurting stop?" "Update: 09/20/96: We aren't saying who the second innocent is, just that he fits in with the "DARK CARNIVAL" and "HOUSE OF HORRORS" level themes." Corpses are dead bodies found in various locations throughout Blood. Some are simply lying down on the ground, others are nailed to walls or dismembered. They do not attack and do not harm the player, but destroying them can occasionally reveal a Life Essence. Some are zombies disguised as corpses. Citizens are either black-haired women wearing urban outfits or dark-haired men with beards, tan pants, and a shirt. They appear in urban areas of Blood II: The Chosen. If you approach them, they will either talk to you or themselves. Men will even insult you or speak confrontationally. If you shoot them, they will cower and wave their arms in the air, but most will not run away. Like the previous citizens, they will occasionally drop a Life Essence. Much like in the first game, the civilians will often appear surrounded by enemies and die in a few seconds. In this case, by the Beta Reality creatures, while the Cabal henchmen tends to just ignorate them. However, the incidence of civilians which will appear out of danger is bigger than in the first game. These, along the Mad Scientist himself, are the only know members of the Cabal who are not directly hostile to Caleb. They are the developers of CabalCo's retail products and weapons and will appear only in Cabal buildings. They wear lab coats with the emblem of CabalCo. and behave identical to the ordinary civilians, cowering and begging for their lives once spotting the protagonist. Sorority girls have the same model, voice, and behaviour as women citizens, but with jeans and red sorority sweaters emblazoned with the Greek letters "IEP" (for their sorority "Iota Eta Pi"). They are only seen in The Nightmare Levels during Ophelia's segment. They also represent a historical anachronism due to their attire as Ophelia would have gone to school around 1847. Typical attire for women of the period involved floor length dresses, petticoats and other Victorian wear but the girls wear attire more common in the 1950s (as a reference to horror films from that decade). "Hey, buddy, you all right? You look like hell." "This can't be happening, I'm gonna be late for work." "Hey, the train is out. Maybe we should catch a cab." "Heh, yeah, that's a good idea." "No weapons allowed in here buddy… unless you buy it from me." "The unstoppable… more like the unmakable." "I don't know, he just stuck his head in too far, I guess." "Yeah, well, you know, I never liked him anyway." "I am hurt very, very badly, but I am not quite dead yet!" This page was last edited on 25 November 2018, at 05:52.